There's Silicon Valley in the San Francisco Bay Area, Silicon Beach in Los Angeles, Silicon Alley in New York, Silicon Hills in Austin and lately tech boosters in New Orleans have been trying to get the name Silicon Bayou to stick. Everybody wants their region to be the next destination for science and technology-oriented companies to set up shop. But guessing (and promoting) the next big tech region is nothing new. After the rise of Silicon Valley in the late 1970s, it was really anybody's guess. The 1982 book The Omni Future Almanac took a stab at trying to predict which regions might be the Silicon Valleys of the future. Everywhere from Columbus, Ohio to Rehovath, Israel made the short list. But some guesses were stronger than others. The University of Texas, backed by oil money and surrounded by wide-open spaces, has attracted some of the best minds in the country, including Nobel Laureate John Wheeler, an astrophysicist. Austin rapidly seems to be turning into a hotbed of technological activity, emphasizing work in astronomical theory and high-energy physics. The Texas center offers researchers big budgets and new facilities. Close at hand are the intense research programs of major oil and chemical companies and a number of well-endowed private foundations, such as the Wadley Institute, which spent millions of dollars to provide interferon for Texas researchers. In all likelihood, the Texas science center will spread across the whole southeastern corner of the state, all the way up to Dallas. Columbus's emergence as a science center has been spurred by the growth of Ohio State University. The heart of the private work done here will reflect the university's strengths in the industrial sciences— lasers, welding, materials formation, adhesives, and so on. A few short years ago Columbus might hove been considered too far from the East and West coasts for convenient use as a high-tech center, but this era of commuter jets has made the area a virtual suburb of New York and Washington. With minimal fanfare, central Vermont is quietly attracting small, high-intensity think tanks and industrial research centers, which will emphasize state-of-the-art sciences: cybernetics, fiber optics, and high speed computers. Leading research companies want their scientists and inventors to have a quiet, undisturbed environment. Vermont is also a focus of development in alternative energy systems and high-tech farming. Science writers of the twenty-first century may find themselves heading for Vermont as often as they used to journey to Cambridge. Discovering and saving water will be a major challenge over the next twenty years, as land grows more dense and desertification increases. The Israelis have one of the world's best desert research programs, and Rehovoth, located in the Negev Desert, is the center of this activity. Solar ponds, magneto-hydrodynamics plants, wind power, hydroponics, and many other environmentally oriented scientific developments will be advanced by work done in the Negev. Genetic engineering and pharmaceutical creations will also receive attention here, and many advances in these fields will first emerge in the Israeli desert. The best that money can buy will come to Saudi Arabia over the next generation as this geographically and culturally isolated Arab nation tries to improve its desert countryside. The Saudi government will attempt to prolong the wealth of its oil fields and prove that Arabs can maintain the pace with Israeli research. Since energy poses no problem, high-energy experimentation may turn out to be a staple here. Obviously, environmental engineering will also hold a special role in any Arabian science center. The French may be on the verge of returning to a leading role in science and technology. The government has committed itself to technological achievement, and the central authority in France has the clout to make its plans take hold. France is pursuing an aggressive nuclear policy, has a space program independent of the European Space Agency, and has become a leading country in interferon research. Major advances in cancer research may, as a result, come out of France. Experimental music and architecture have also flourished recently in France. Scientists are already conducting tidal power experiments along the Brittany coast, and Frenchmen can now travel from Paris to Marseilles on a train that averages over 200 miles per hour. Research centers in Paris and its environs may generate some of the most exciting research and inventions of the next generation. Austin was an obvious choice, given the university there. And it would have been even more so had the writers of the Almanac known that Michael Dell was a student at UT-Austin in the early '80s, and that he'd go on to take his massively influential laptop company public in 1988. A city like Burlington, Vermont made slightly less sense—but I wouldn't write off Silicon Ski Slope just yet. 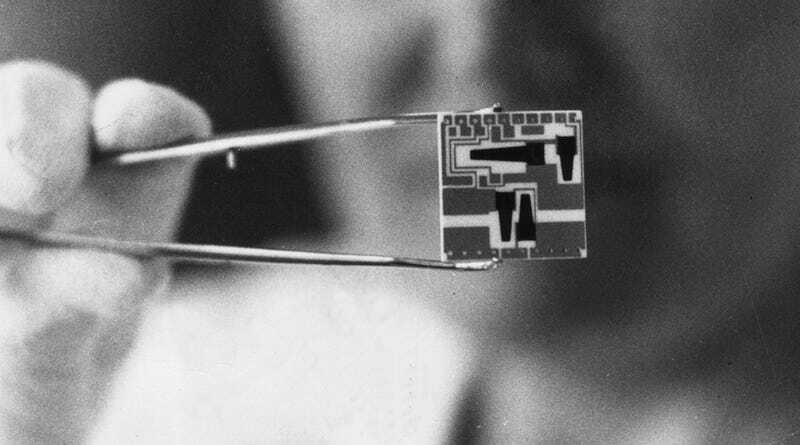 Image: 1974, Getty Images "An integrated circuit or silicone chip manufactured at the Telecommunication Industrial Research Institute in Budapest."